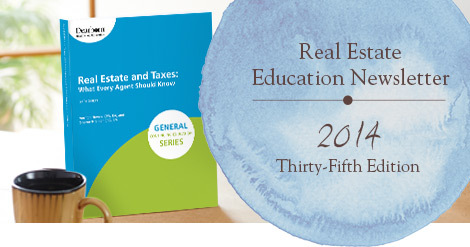 New Edition of Real Estate and Taxes: What Every Agent Should Know! In clear and simple language, this text demystifies tax laws and their impact on anyone owning or selling real estate. Students will receive a background on basic tax issues and learn to apply calculations and formulas to better assist clients on tax-related questions and issues. Updates include recent tax law changes, and a discussion of tax issues regarding cancellation of debt, foreclosure, and repossession. Real-life examples and case studies with discussion questions offer a context for the material covered. For more information, contact your Client Experience Manager at 800.958.6707 or salesops@dearborn.com. Arello released new standards and policies, and we’ve got you covered. REcampus partners should stay tuned for additional communications from Dearborn. &copy !important;2014 Dearborn. All Rights Reserved.